The state backward classes welfare department has issued notifications, announcing the formation of two more development boards for Bhujels and Newars, the communities found across the Darjeeling hills and in some areas of the plains. With the formation of the two new bodies, there are now 12 boards in total functioning for the development of hill communities. Pradeep Kumar Khawas, the chairman of Bhujel (Khawas) Cultural and Welfare Association, said at a news conference here today that the state had issued the notification on November 11. "We are elated to learn that the state has created a separate development board for uplifting the Bhujel community. 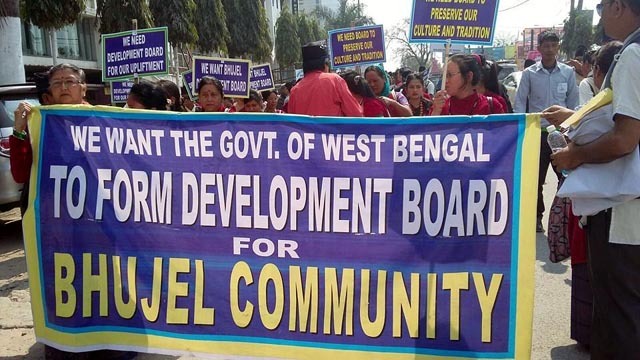 There are around 50,000 Bhujels who reside in all three hill subdivisions, Siliguri and some other areas," Khawas, who has been nominated as the chairman of the West Bengal Bhujel Development and Cultural Board, said. The Bhujel board, he said, would work for socio-economic development of the community. Its head office, as per the notification, will be in Kalimpong and will have a 31-member executive committee. While attending a programme organised by Mayel Lyang Lepcha Development Board in Kalimpong on September 22, chief minister Mamata Banerjee had announced that the state would form separate boards for Bhujels and Newars. "Our board will work to preserve, promote and safeguard the language and heritage of Bhujels that is on the verge of extinction," Khawas said. Most of the Bhujels, he said, are farmers, fishermen and day wage earners. The board members are yet to know about the funds which the state would allot to the body. In a similar manner, the state has also formed the West Bengal Newar Development and Cultural Board. However, unlike the Bhujels, a tug-of-war has begun between two organisations representing the Newars over the board. "While the Newar Yuva Sangathan that is based in Kalimpong wants the board to function from there, the Kurseong Newar Kalyan Sangathan wants the board's office to be set up in Kurseong," said a source.